This page contains brief information on recent astronomical discoveries as reported in the International Astronomical Union Circulars (IAUCs) (published by the Central Bureau for Astronomical Telegrams) and the Minor Planet Electronic Circulars (MPECs) (published by the Minor Planet Center), as well as links to ephemerides and orbital elements for comets and minor planets. The objects below are listed in chronological order of announcement, by category of object, the most recent first. You are strongly advised not to make direct links to pages beneath this page, other than links to `index.html' pages, as they may be temporary or be moved or renamed as circumstances dictate. Some Press Information Sheets are available. For links to individual comets, see the CSC/CSL/CSA webpages. Ephemerides and orbital elements for (potentially) observable comets. Note that near-sun comets observed only from space are generally excluded from this listing. C/2017 T1 (Heinze). Discovered by Aren Heinze, University of Hawaii, in the course of the "Asteroid Terrestrial-impact Last Alert System" (ATLAS) search program with the ATLAS 0.5-m Schmidt telescope at Mauna Loa, Hawaii (USA). Details available here. C/2017 S7 (Lemmon). Discovered as apparently asteroidal on images taken by R. G. Matheny with the 1.5-m reflector at Mount Lemmon in Arizona (USA), and found to show cometary appearance by observers elsewhere. Details available here. C/2017 S6 (Catalina). Discovered as apparently asteroidal on images taken by G. J. Leonard with the 0.68-m Schmidt telescope at Catalina in Arizona (USA), and found to show cometary appearance by observers elsewhere. Details available here. P/2017 S5 (ATLAS). Discovered on CCD images taken with the 0.5-m f/2 Schmidt telescope at Haleakala (Hawaii, USA) in the course of the "Asteroid Terrestrial-impact Last Alert System" (ATLAS). Details available here. 361P/2017 S4 = 361P/2006 UR111 (Spacewatch). Discovered on CCD images taken with the 1.8-m Pan-STARRS1 telescope at Haleakala (Hawaii, USA) in the course of the "Panoramic Survey Telescope and Rapid Response System" in Sept. 2017, and then linked to an apparently asteroidal object discovered by J. V. Scotti with the Spacewatch 0.9-m reflector at Kitt Peak in Oct. 2006 (which had already been then given a minor-planet designation). Now numbered as a short-period comet with two observed apparitions. Details available here. C/2017 S3 (PANSTARRS). Discovered on CCD images taken with the 1.8-m Pan-STARRS1 telescope at Haleakala (Hawaii, USA) in the course of the "Panoramic Survey Telescope and Rapid Response System". Details available here. C/2017 S2 (PANSTARRS). Discovered on CCD images taken with the 1.8-m Pan-STARRS1 telescope at Haleakala (Hawaii, USA) in the course of the "Panoramic Survey Telescope and Rapid Response System". Details available here. P/2017 R1 (PANSTARRS). Discovered on CCD images taken with the 1.8-m Pan-STARRS1 telescope at Haleakala (Hawaii, USA) in the course of the "Panoramic Survey Telescope and Rapid Response System". Details available here. 360P/2017 S1 = 360P/2014 P4 (WISE). Recovery of comet P/2014 P4 by E. Schwab (Egelsbach, Germany) on CCD images obtained in Sept. 2017 with the 1.0-m f/4.4 reflector at the ESA Optical Ground Station at Tenerife, Canary Islands. Numbered as comet 360P, with two observed apparitions now of this short-period comet. Details available here. 358P/2017 O3 = 358P/2012 T1 (WISE). Recovery of comet P/2012 T1 in July 2017 independently by Marco Micheli, Henry H. Hsieh et al. (with the 8.1-m "Gemini South" telescope at Cerro Pachon, Chile) and by M. Mommert and J. Agarwal (with the 4.1-m SOAR telescope also at Cerro Pachon). Subsequently umbered as comet 358P, with two observed apparitions now of this short-period comet. Details available here. 359P/2017 Q2 = 359P/2007 RS41 (LONEOS). Discovery of comet P/2017 Q2 on images obtained with the Pan-STARRS1 1.8-m telescope at Haleakala, Hawaii, on 2017 Aug. 22, and then found to be identical with an apparently asteroidal object discovered with the 0.59-m LONEOS Schmidt telescope in Arizona in 2007 (when it was then given the minor-planet designation 2007 RS41). Subsequently umbered as comet 359P, with two observed apparitions now of this short-period comet. Details available here. C/2017 P2 (PANSTARRS). Discovered on CCD images taken with the 1.8-m Pan-STARRS1 telescope at Haleakala (Hawaii, USA) in the course of the "Panoramic Survey Telescope and Rapid Response System". Details available here. 357P/2017 Q1 = 357P/2008 T4 (Hill). Recovery of comet P/2008 T4 on images obtained with the Pan-STARRS1 1.8-m telescope at Haleakala, Hawaii. Subsequently umbered as comet 357P, with two observed apparitions now of this short-period comet. Details available here. C/2017 P1 (PANSTARRS). Discovered on CCD images taken with the 1.8-m Pan-STARRS1 telescope at Haleakala (Hawaii, USA) in the course of the "Panoramic Survey Telescope and Rapid Response System". Details available here. For comets announced prior to 2017, go to the older Headlines webpage. Recent magnitude estimates for observable comets (as reported to the CBAT and the International Comet Quarterly). 2011 MD. Minor planet (size perhaps 5-15 meters) made fifth-closest observed approach on record to earth on June 27.71 TT (0.000125 AU). IAUC 9218, 2011 June 25. Click here for a diagram depicting the close approach to the earth by Syuichi Nakano. 2011 CQ1. Minor planet (size perhaps 1-2 meters) made second-closest observed approach on record to earth on Feb. 4.82 UT (0.000079 AU). IAUC 9198, 2011 Feb. 12. Click here for a diagram depicting the close approach to the earth by Syuichi Nakano. (596) Scheila. Main-belt minor planet exhibiting major comet-like outburst. IAUC 9158, 2010 Aug. 6. 2010 NV1 and 2010 OR1. Asteroidal objects in retrograde orbits. IAUC 9158, 2010 Aug. 6. 2010 GW64. Asteroidal object in a retrograde orbit. IAUC 9148, 2010 May 14. 2010 EB46. Asteroidal object in a retrograde orbit. IAUC 9128, 2010 Mar. 18. 2009 QY6 and 2010 CG55. Asteroidal objects in retrograde orbits. IAUC 9123, 2010 Mar. 10. 2009 YS6. An asteroidal object in a retrograde orbit. IAUC 9102, 2009 Dec. 31. The name "Weywot" has been assigned to the transneptunian minor planet (50000) Quaoar I. IAUC 9094, 2009 Nov. 11. 2009 UG89. An asteroidal object in a retrograde orbit. IAUC 9091, 2009 Nov. 2. 2009 HC82. An asteroidal object in a retrograde orbit. IAUC 9042, 2009 May 8. 2009 DD45. An asteroidal object perhaps 19 meters in size that passed only 0.000482 AU from the earth on Mar. 2.57 UT. IAUC 9024, 2009 March 4. 2008 TC3. An asteroidal object perhaps 2-3 meters in size, which was discovered at Mt. Lemmon on Oct. 6.28 UT, will hit the earth's atmosphere on Oct. 7.115 over Sudan, moving west to east (contrary to the wording on IAUC 8990) at a velocity of 12.9 km/s. 2008 Oct. 6. 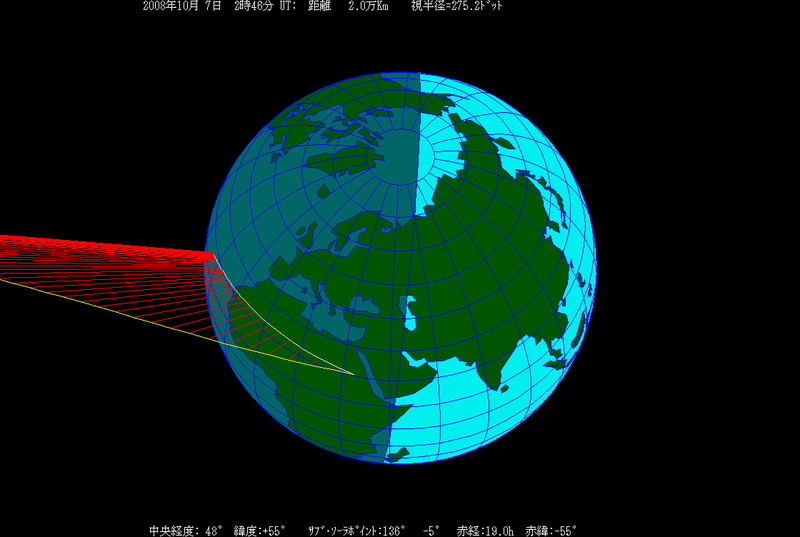 A computer-generated image (created by Syuichi Nakano, Sumoto, Japan) of the collision of 2008 TC3 with the earth is available here. Most (if not all) of the object was expected to burn up upon entry through the earth's atmosphere, though it is likely that some (perhaps many) smallpieces (a few cm or a few mm in size) survived to hit the ground as meteorites. A Meteosat 8 satellite image of the entry of 2008 TC3 into the earth's atmosphere over northern Sudan is available here (kindly supplied by Jiri Borovicka). The name "Haumea" has been assigned to the transneptunian dwarf planet (or plutoid) whose designation is (136108) 2003 EL61. IAUC 8976, 2008 Sept. 17. The name "Makemake" has been assigned to the transneptunian dwarf planet (or plutoid) whose designation is (136472) 2005 FY5. IAUC 8960, 2008 July 18. 2008 KV42 is an apparently asteroidal object (discovered by B. Gladman et al. at Mauna Kea) with a retrograde orbit (i = 103 deg) and a Neptune-crossing orbit (q around 20 AU, Q around 72 AU). IAUC 8960, 2008 July 18. 2007 VA85 is an apparently asteroidal object (discovered by the LINEAR project) with the shortest known orbital period (7.6 yr) for a sun-orbiting natural object with a retrograde orbit (i = 132.6 deg). IAUC 8894, 2007 Nov. 10. (136199) Eris = 2003 UB313. Discovery of a transneptunian object of similar absolute brightness to Pluto (along with two other TNOs that are also relatively bright -- near 17th magnitude). IAUC 8577 and MPEC 2005-O41 (2005 July 29). Naming announced on IAUC 8747 (2006 Sept. 13). For objects announced prior to 2006, go to the older Headlines webpage. Ephemerides and orbital elements for observable NEOs and unusual minor planets. Ephemerides and orbital elements for observable distant minor planets. Ephemerides and orbital elements for critical-list numbered minor planets. S/2010 J 1 and S/2010 J2: new satellites of Jupiter. CBET 2734, 2011 June 1; IAUC 9222, 2011 Sept. 10. S/2011 (134340) 1: new satellite of (134340) Pluto. CBET 2769, 2011 July 20; IAUC 9221, 2011 Sept. 10. Saturn XXVIII renamed from Erriapo to Erriapus. IAUC 9191, 2011 Jan. 1. Designation and name assigned to S/2003 J 17 (the 50th satellite of Jupiter to be so designated and named): Jupiter L (Herse). IAUC 9094, 2009 Nov. 11. S/2009 S 1, a new satellite of Saturn. IAUC 9091, 2009 Nov. 2. Discovery of CO in Neptune I (Triton). IAUC 9071, 2009 Sept. 10. Impact of a possible comet onto Jupiter. IAUC 9060, 2009 July 31. New name/designation of satellite of Saturn (LIII), S/2008 S 1. IAUC 9041, 2009 May 5. Transneptunian minor planet 2002 VF130 found to be binary. IAUC 9040, 2009 May 5. S/2008 S 1, a new satellite of Saturn. IAUC 9023, 2009 March 3. Two satellites of the main-belt minor planet (216) Kleopatra, S/2008 (216) 1 and S/2008 (216) 2. IAUC 8980, 2008 Sept. 24. A satellite of the Apollo-type minor planet (35107) 1991 VH. IAUC 8977, 2008 Sept. 19. Two companions to minor planet (153591) 2001 SN263. IAUC 8921, 2008 Feb. 13. New names of satellites of Saturn (XLIX-LII). List of satellites and companions of minor planets that have been announced on CBAT publications. For objects announced prior to 2008, go to the older Headlines webpage. PR Lup = Nova Lup 2011. Discovery by Nicholas J. Brown of Australia. IAUC 9228, 2011 Sept. 12. V1312 Sco = Nova Sco 2011. Discovery by John Seach of Australia. IAUC 9216, 2011 June 8. Outburst of T Pyx (first in 45 yr). Discovery by M. Linnolt of Hawaii. IAUC 9205, 2011 Apr. 18. V5588 Sgr = Nova Sgr 2011 No. 2. Discovery by K. Nishiyama and F. Kabashima of Japan. IAUC 9203, 2011 Mar. 30. V5587 Sgr = Nova Sgr 2011. Discovery by H. Nishimura of Japan. IAUC 9196, 2011 Feb. 5. Outburst of apparent flare star in M45. Discovery by R. Castellano of Italy. IAUC 9181, 2010 Nov. 4. V1723 Aql = Nova Aql 2010. Discovery by K. Nishiyama and F. Kabashima of Japan. IAUC 9167, 2010 Sept. 11. V1311 Sco = Nova Sco 2010 No. 2. Discoveries by numerous observers in Japan. IAUC 9142, 2010 May 4. V5586 Sgr = Nova Sgr 2010 No. 2. Discovery by K. Nishiyama and F. Kabashima of Japan. IAUC 9140, 2010 Apr. 26. V407 Cyg in nova-like outburst. IAUC 9130, 2010 Mar. 20. GK Per in outburst. IAUC 9122, 2010 Mar. 9. V1310 Sco = Nova Sco 2010. Discovery by K. Nishiyama of Japan. IAUC 9120, 2010 Mar. 1. V2674 Oph = Nova Oph 2010 No. 2. Discovery by H. Nishimura of Japan. IAUC 9119, 2010 Mar. 1. V5585 Sgr = Nova Sgr 2010. Discovery by J. Seach of Australia. IAUC 9112, 2010 Jan. 28. U Sco. First outburst (at mag 8) since 1999. IAUC 9111, 2010 Jan. 28. V2673 Oph = Nova Oph 2010. Discovery by H. Nishimura of Japan. IAUC 9111, 2010 Jan. 28. For objects announced prior to 2010, go to the older Headlines webpage. The CBAT's working list of novae in the Milky Way can be found here. A list of (apparent) novae in M31 reported to the CBAT beginning in 2004 can be found here. A list of (apparent) novae in M33 reported to the CBAT can be found here (webpage begun in early 2009). A list of (apparent) novae in M81 reported to the CBAT can be found here (webpage begun in early 2009). A list of recent supernovae is available, as is our on-line form for checking possible supernova candidates. A list of possible supernovae (with PSN designations assigned by the Central Bureau) is maintained here, as well. David Bishop maintains a website showing images of recent supernovae. The best guide for ephemerides for forthcoming periodic comet returns is the annual ICQ Comet Handbook. Predicted elements for returns up to three years into the future are published in the Minor Planet Circulars. Ephemerides for all currently-observable comets may be generated in the CBAT/MPC Computer Service. The main advantage of having your own personal subscription to the IAUCs and CBETs is obvious: you would no longer have to rely on second- or third-hand sources for information on new astronomical discoveries. A less obvious advantage is that the more subscribers we have, the less we have to charge per subscription to cover our costs. We are a non-profit organization--if we increase our subscriber base significantly, we can reduce the subscription rates by substantial amounts. You would also be supporting a 125-year-old trustworthy, refereed, carefully edited source of astronomical news that is both unique and in need of your support for continuing operation. A look at the Recent News above shows you what you have been missing by not subscribing. The uninvoiced e-mail delivery of both IAUCs and CBETs, via a subscription to our Computer Service, is currently only US$6 per month--a real bargain! Full details on how to subscribe are also available.